EIA expects that U.S. average household expenditures for heating oil and propane for the 2017–18 winter will be higher than last winter according to the January Short-Term Energy Outlook (STEO). Compared with last year, higher crude oil prices and lower inventory levels are putting upward pressure on the prices for heating fuels (Figure 1). In addition, forecasts for a colder winter than last year—one of the warmest on record for much of the United States—are expected to increase heating fuel consumption. As a result of increased prices and higher consumption, EIA expects average household expenditures for heating oil and propane to increase from last year’s levels. 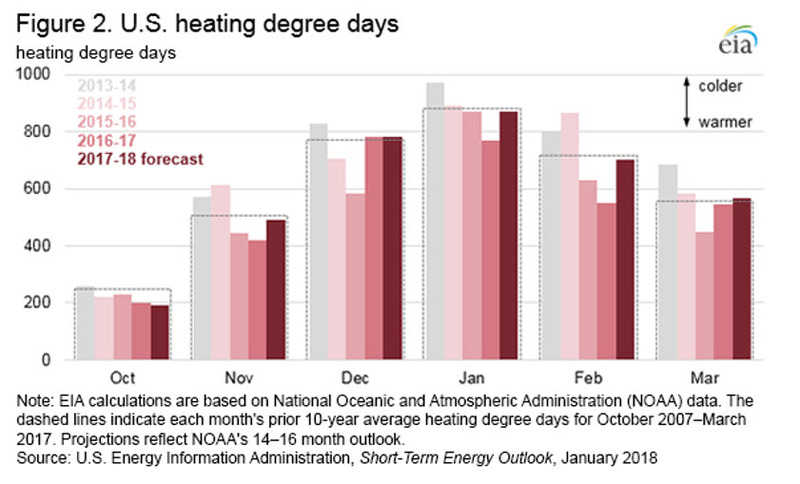 Temperatures this winter, based on the forecast of heating degree days from the National Oceanic and Atmospheric Administration, are expected to be colder than last winter with approximately 10% more heating degree days. Nevertheless, this winter is expected to be slightly warmer than normal with 2% fewer heating degree days than the 10-year average (Figure 2). U.S. total distillate inventories, which include all sulfur levels of distillate, for the winter heating season (October through March) were 23 million barrels (15%) below 2016 inventories at the beginning of October and remained nearly 30 million barrels (18%) below 2017 levels as of January 12. Since October 2017, U.S. winter inventories of ULSD have remained between 12% and 16% below the previous year’s inventory levels for the same period. The continued transition to the use of ultra-low sulfur diesel (ULSD) for heating has increased the relevance of assessing ULSD inventories for heating fuels. Reliance on heating oil is highest in the Northeast—Petroleum Administration for Defense District (PADD) 1—where about 21% of households in the region use oil for space heating. ULSD inventory levels in the region were nearly 49% below 2017 levels as of January 19, and total distillate inventory levels were nearly 34% below last year’s levels. Strong exports of distillate, some of which can be used as home heating oil, are contributing to lower inventories. Since the beginning of October 2017, exports (based on a four-week moving average) have exceeded those during the same time last winter for 13 out of 15 weeks. U.S. demand for distillate remained relatively stable in 2017 through October, with EIA’s proxy for demand, product supplied, fluctuating between 2% lower than and 6% higher than 2016 levels. Higher crude oil prices are also contributing to heating fuel price increases. The Brent crude oil price is the most influential crude oil price in determining U.S. petroleum product prices. For the week ending January 12, the Brent crude oil price was $69.47 per barrel (b), more than $15/b higher than the same time last year. EIA forecasts that the price of Brent will average $61/b this winter, which is more than $9/b higher than last winter (Figure 3). As of January 15, the U.S. average residential retail heating oil price was $3.21 per gallon (gal), 58 cents higher than at the same time last year. The January STEO forecasts that the price for heating oil in the 2017–18 winter season will average $2.79/gal, 40 cents higher than the previous year. Consumption per household is forecast to increase by 7% to 553 gallons. As a result of both higher forecast prices and consumption, EIA expects households that heat primarily with heating oil will spend an average of $1,570 this winter, $323 more than last winter. Increases in EIA’s projected household expenditures on propane vary by region. EIA expects that households heating with propane in the Northeast (PADD 1) will spend an average of $2,246 this winter, $256 (13%) more than last winter. These increased expenditures combine a 6% increase in consumption and a 7% increase in the fuel price. EIA expects households heating with propane in the Midwest (PADD 2) will spend $1,466 on average, $291 (25%) more than last winter, reflecting 12% increases in both propane prices and consumption. 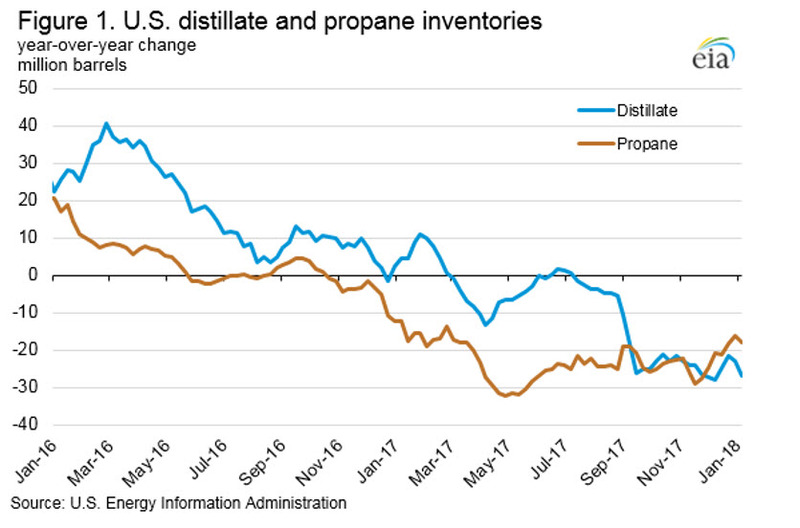 U.S. propane inventories at the beginning of October were 78.9 million barrels, 25 million barrels below inventories at the beginning of winter last year. As of January 19, inventories were 54 million barrels, 14.2 million barrels below the same time last year. The Midwest, which is the region most reliant on propane for heating and agricultural purposes, began this winter with inventories slightly below last year’s levels. Strong global demand for propane has provided export opportunities, and weekly U.S. exports (based on a four-week average) of propane have exceeded last year’s volumes in 11 of the 15 weeks so far this winter. The U.S. average regular gasoline retail price rose 1 cent from the previous week to $2.57 per gallon on January 22, 2018, up 24 cents from the same time last year. East Coast gasoline prices increased nearly four cents to $2.56 per gallon, Gulf Coast prices increased over three cents to $2.31 per gallon, Rocky Mountain prices increased nearly two cents $2.47 per gallon, and West Coast prices increased over one cent to $3.02 per gallon. Midwest prices fell nearly four cents to $2.47 per gallon. The U.S. average diesel fuel price fell less than 1 cent, remaining at $3.03 per gallon on January 22, 2018, 46 cents higher than a year ago. Rocky Mountain prices dropped nearly three cents to $2.96 per gallon, Midwest and Gulf Coast prices each fell by one cent to $2.97 per gallon and $2.82 per gallon, respectively, and West Coast prices fell less than one cent, remaining at $3.40 per gallon. East Coast prices rose nearly two cents to $3.08 per gallon.